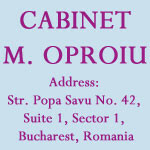 CABINET M. OPROIU has long been quoted at the forefont of IP practice in Romania. The firm built up a strong and varied experience of high level of specialization in all areas of IP practice, being consistently ranked as of the top Romanian IP team by the most legal guides. Based on our experience, we areable to provide competent advice and representation of clients in all IP matters, including litigations.